NetTESTER is a range of Embedded Ethernet Network Performance Testing monitors which can make your complex network systems easy to monitor. Operating under remote management control, within both Switched and IP-Routed infrastructures, NetTESTER devices generate test traffic, perform line-rate loop-back with address-swapping, and submit network health reports back the Network Control Centre, as a vital aide to performance verification and trouble-shooting. The NT1005 is a powerful & versatile Ethernet Network Performance tester, typically deployed by Enterprises at their connection points to Carrier-providedWide-Area Networks,for verification of the characteristics of Carrier services. Normally transparent to all network traffic, the NT1005 is a device for installation left 'in-situ' between the Carrier's termination point and the Enterprise's own Switch or Router, ready to be activated remotely for testing purposes as and when required. 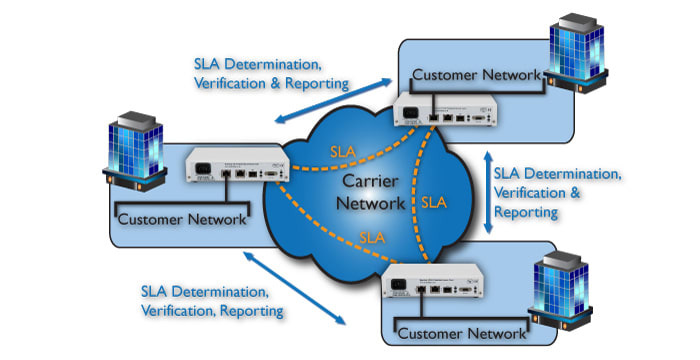 Operating with both layer-2 and Layer-3 addressing, the NT1005 contains custom- hardware for the generation of test traffic, loop-back (by line-rate packet-level Source/Destination address swapping) and analysis, to Industry-standard test profiles including RFC 2544 and ITU-T Y.1564. Optionally, the NT1005 can be configured to operate whilst the network is 'in-service', providing real-time monitoring of jitter, latency and packet-loss between other points in the network via the use of ITU-T Y.1731 (for Layer-2 traffic) or TWAMP ('Two-way Active Measurement Protocol', for IP-addressed traffic), SNMP alarms being issued to one or more Management stations should pre-defined 'Service Level Agreement' criteria fail to be met. The NT1005 is available in a choice of 100-250 VAC or -48 VDC integrated power supplies, although a 12V-24V DC version is also available on request. The NT1005 can easily be rack mounted in either a 1U two unit rack mount kit, a 6U eighteen unit rack mount kit. A 1U rack mount kit is also available for the Redundant Dual AC PSU version. Please contact Metrodata for price and availability of SFP modules including standard 1310nm singlemode as well as long haul, 1550nm, bi-directional and CWDM. By deploying Metrodata's NetTESTER family devices, standard tests such as RFC2544 and/or ITU-T Y.1564 can be instigated at any time between different segments of the WAN, with the results monitored remotely at the Network Operations Centre (NOC). 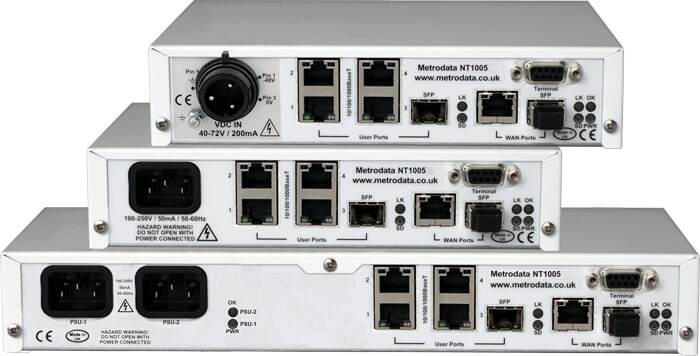 The NT1005, like its sister unit, the NT1003, generates both Layer-2 (Ethernet MAC addressed) and/or Layer-3 (IP) test traffic and can also perform line-rate Source/Destination Address swapping loop-back, via Metrodata's custom 'MetroSAM' (Service Assurance Module) hardware. Optionally, by integrating the NT1005 more closely into the network, using the ITU-T Y.1731 and/or TWAMP protocols, test units can be configured to provide background monitoring of network performance relative to pre-defined SLA criteria, providing alarms to the NOC in the event of a breach of contracted performance from one or more Network Carriers. If you require further information on the NT1005 please contact our sales team with your requirements. Whilst the NetTESTER product range uses industry standard user exchangeable SFP and SFP+ transceivers, it is recommended that these are purchased from Metrodata to guarantee their specification and compatibility with each other.